Adventures in Hectic Eclectic: Rhythm. Over at Lisa-Jo Baker's blog, each Friday, she challenges writers to write for five whole minutes without stopping, without editing. Join us. This week's prompt: Rhythm. I have been practicing Nichiren Buddhism since 2004 and up until this year, I used the SGI liturgy. Earlier this year, I started practicing in the style of Nichiren Shu. The liturgy is very similar, the chant remains the same, but with a few differences. 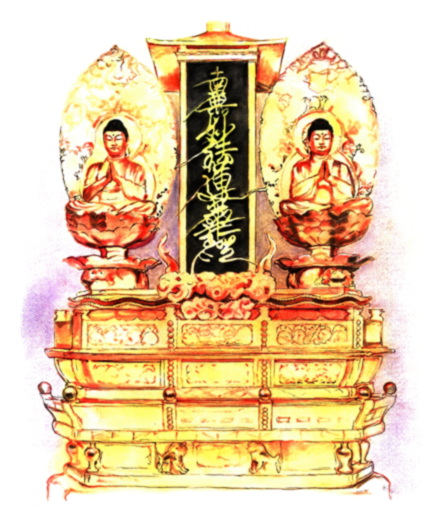 In order to make things more rhythmic, the SGI altered some of the liturgy and shortened a few of the Japanese words. In Nichiren Shu, that is not the case. And, as one would expect, it completely changes the rhythm of the Practice of Odaimoku. Also with chanting Namu-myo-ho-renge-kyo. In SGI the rhythm is faster: nam-myohorengekyo, but but adding the "u" at the end to nam - Namu - the rhythm slows: namu-myo-ho-renge-kyo. The result is, for me, a more mindful practice. It goes a little slower, but there is time in those spaces to truly take in what I am chanting, what it means and how it flows. Instead of racing through the chanting of the chapters, I am more contemplative. Instead of simply repeating nam-myohorengekyo over and over, I am aware of the power of the chant. Altering the rhythm of my practice has altered my practice of Nichiren Buddhism, and ultimately, this alteration will be found in the rhythm of my own life. I think there's such truth here...that slowing down and taking in what we're saying, whether chanting or prayer, is a good thing. I'm kind of guilty of spouting out whatever comes to mind...and reflection and carefully choosing words is never a bad thing. Good thoughts. :) Blessings! When I was a practicing Catholic, it helped to slow down and contemplate standard prayers like The Lord's Prayer. We become so accustomed to the way we pray/chant, that it happens quickly and without much thought. Buddhism's ideas of mindfulness and presence helps enhance prayer. Like when you go out for coffee with a friend and she's all distracted and checking her phone - not nice, right? But if she is there, present, aware and attentive - different story. So. Awareness, presence and attention in prayer/chanting is highly beneficial. Changes your practice and that, in turn, ultimately changes your life.